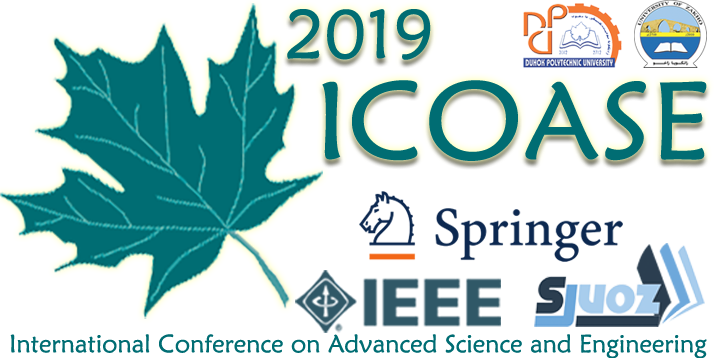 Welcome to the 2nd International Conference on Advanced Science and Engineering 2019 (ICOASE2019). The conference is technically sponsored by IEEE which is represented by the IEEE Iraq Section. The conference is jointly organized by the University of Zakho and Duhok Polytechnic University. The Conference is the premier forum for presenting the new results of advanced topics in science, engineering, and their applications. The aim of the conference is to bring together leading academic, scholars and students, in order to discuss theoretical and practical issues through sharing their experiences and research results. Its focus is to create and distribute knowledge about the use of scientific and engineering applications. If the quality and findings of the paper are not well explored and convincing. This will be checked by IEEE, Springer, and SJUOZ which applies to all accepted papers. Any accepted paper that will not be presented at the conference will be withdrawn from the conference proceeding, and will not be submitted to any publisher.